As more and more research continues to be released about the dangers and major downfalls of overloading our children with added sugars and processed ingredients, Halloween always becomes a bit of an obstacle. Many of us still want to make the holiday just as fun for our children and community, but how do we do that without having to succumb to the pressures of giving out sugar-filled, calorie packed, Halloween baskets?! One proven way to get kids to drink their milk is to flavor it, but regular flavored milk can be packed with added sugars. Got Milk? Magic Straws comes in many great flavors and transform plain milk to flavored with just 1 tsp (17 calories) per straw. Magic Milk Straws are a fun, mess-free way to enjoy a cold glass of milk. The rich, all-natural cocoa, strawberry, vanilla and cookies and cream flavored milk straws magically transform milk into a delicious (and nutritious!) treat. Look for fruit-based options that have kid appeal, too. Fruit Squeezers by Nature’s Child that feature kid cartoons on each package, like Dora and SpongeBob, and are made from 100-percent fruit without any added sugars. Each pouch has 60 calories, is a good source of vitamin C and counts as a fruit serving. The best treat yet: Toys! According to a study done by Yale University* children are just as excited to get toys on Halloween as they are about candy. Scary stickers, temporary tattoos and glow sticks are just a few ideas of some fun basket stuffers that kids would love on Halloween. Nuts are a great snack to keep tiny tummies satisfied with the fiber and protein they provide. Since nuts are high in calories, look for the single-serve packages that keep calories in check. For example, Trader Joe’s offers individual packs on Omega Trail Mix, offering tons of nutrients in an easy-to-eat packet of trail mix ingredients. At first glance, these on-the-go snack bars are definitely high in sugar. But the important thing is they are packed with all natural sugars from natural food sources. Apple Pie, Banana Bread and Pumpkin Pie are all great, delicious flavors of the season, and they come in lots of exciting colors. For more information on how to keep a healthy lifestyle with our top Wellness Professionals, give us a call at (800) 507-2634 for you Complimentary Nutrition Screening! Have a Healthy and Safe Halloween! *Source: Schwartz, MB. “Trick, treat or toy: Children are just as likely to choose toys as candy on Halloween.” Journal of Nutrition Education and Behavior. 2003 Jul-Aug.
October 15, 2013. Tags: Dr. Yvette Flores, halloween, healthy eating, holidays, kid's health, mothers, nutrition, Pediatric Physical Therapy, Physical Therapy Santa Monica, PT Solutions. Uncategorized. Leave a comment. This Tuesday, April 30th at 11pm on CBS 2, news reporter Kristine Lazar will be covering the topic of plagiocephaly. This segment features Dr. Flores and a few of our patients and we wanted to make sure you all had the opportunity to tune in! Feel free to share this useful information with other new parents to help spread awareness of how to prevent plagiocephaly in newborns. If you happen to miss it, don’t worry. The segment will be archived at http://cbsla.com the following day. April 29, 2013. Uncategorized. Leave a comment. 1. What is plagiocephaly, also known as flat head syndrome? Plagiocephaly refers to a deformity of the skull in which one side is more developed in the front, and less developed in the rear. It generally occurs in newborns and infants. In severe cases, it can cause facial asymmetries; on the less developed rear side (flat side), the face & forehead can look more prominent, the ear can be positioned more forward than the other and the eye on that side can appear larger. 2. How does plagiocephaly happen? Plagiocephaly results when repeated prolonged pressure is placed on one side of the back of the skull, causing that part of the skull to be pushed inward at the point of contact. This usually occurs during the most malleable period of skull development, from birth to 5 months of age and happens when a newborn/ infant prefers turning their head toward one side more so than the other. Over time, the back of the skull on the favored side starts to deform, typically appearing flat behind the back of the ear. As this part flattens, the front part of the skull (forehead) begins to bulge out, as if the whole side of the skull shifted forward from back to front. 3. What causes a newborn/ infant to favor turning their head to one side? Tight neck muscles on one side typically cause a newborn/ infant to turn their head away from that tight side in an effort to get comfortable and avoid a ‘pulling sensation’ caused by turning their head toward any tightness. In severe cases, the positional favoring becomes habitual over time, which can then result in accelerated and severe head flattening. 4. How do I know if my child is at risk? There are several distinguishable risk factors to help a parent determine if their newborn is at risk of developing plagiocephaly. If newborns are positive in 3 or more of the following risk factors, an early prevention physical therapy evaluation is recommended to help parents prevent plagiocephaly. 5. What can I do to prevent head flattening in my newborn/ infant? Review the above risk factors to determine if your child is at risk and if so, schedule an early intervention examination & consultation with a pediatric physical therapy specialist. The ideal age for this screen is 6 to 10 weeks of age. In severe cases, head deformation can be seen as early as 4 weeks of age but on average is seen by 12 weeks of age. If your child is not at risk, just remain mindful and make sure to alternate head position during sleep in combination with increasing bouts of daily awake tummy time for best practices. 6. What can I do to improve existing head flattening? Time is of the essence as head flattening can get worse over time and more difficult to correct the older the child gets. Physical therapy intervention is the ideal solution for helping parents correct existing head flattening as well as correcting the ‘root cause’ of the flattening, and the sooner the better. There is a significantly high success rate improving head flattening with physical therapy alone if initiated within 4 wks to 12 wks old because there is greater compliance with sleep positioning techniques, minimal to no habitual side favoring has formed yet and the overall ease of stretching exercises is greatest when the child is smallest. If therapy is initiated past 4 to 5 months of age, the success rate of just physical therapy alone decreases but depends on how severe the flattening is and how severe the cause of the flattening is. Habitual favoring tends to develop from here on out, which is extremely difficult to correct. The older they get, the more engrained their habitual preferences become, and the harder it is for therapists and parents to correct due to resistance. 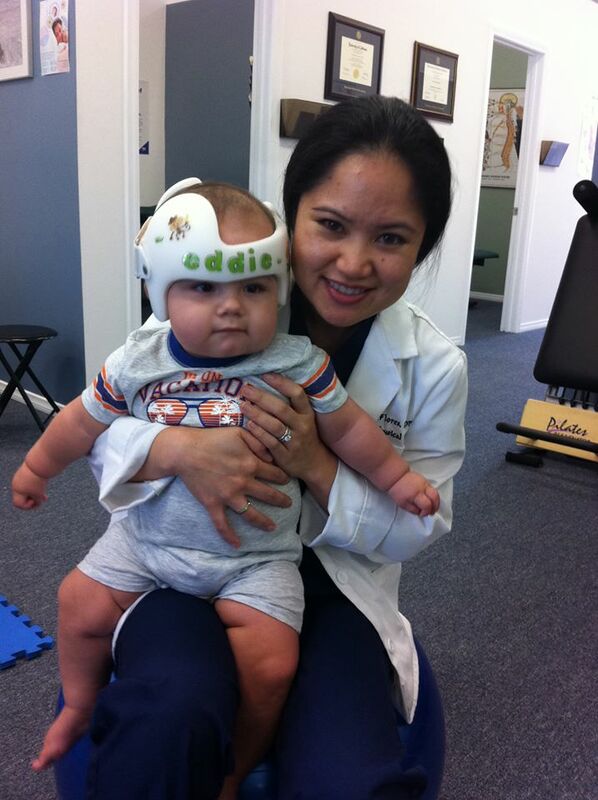 In cases of moderate to severe head flattening in infants older than 5 months, helmet therapy is usually recommended along with physical therapy. 7. Does my child need to get a helmet to correct head flattening? According to pediatric cranial specialists, the helmet does its best work when placed on a child anytime between 5 months to 8 months of age. Children diagnosed with moderate/severe to severe plagiocephaly at 5 months of age are recommended to do helmet therapy if they didn’t start PT yet, started PT late or progress with PT alone has been minimal. However, children that are 5 months of age, demonstrating consistent improvements in head shape with early physical therapy and repositioning, have the option of waiting one to two more months to see how much more progress can be made before considering helmet therapy. 8. Can head flattening return or worsen again? Yes but that depends. If your child completed helmet therapy early with no physical therapy intervention, the underlying cause of the flattening can still be present; habitual favoring can still be an issue and flattening of the same spot can re-occur. The skull is pliable (moldable) up to 12 months of age, at which point it begins to harden. After 12 months of age, there is a high likelihood that any residual flattening will carry over into adulthood. 9. Can I see a physical therapy specialist without getting a referral from my child’s pediatrician? Yes. In the state of California, patients do not need a physician’s referral or prescription to complete a physical therapy evaluation. If your child is a candidate for a physical therapy program, your physical therapist can work with you to request your pediatrician’s signature on their report of findings & recommendations, which then serves as a prescription for PT. 10. Can I request to have my child participate in a program of physical therapy from my child’s pediatrician? Yes. At any given time, parents can always insist on a physical therapy evaluation and treatment program. Your therapist will need to submit strong evidence that warrants physical therapy intervention in order for your pediatrician to sign off on a program of care after the initial evaluation. 11. Does plagiocephaly affect brain function? No. Plagiocephaly has not been associated with affecting brain or cognitive development. 12. Does plagiocephaly affect anything serious aside from being cosmetic? Significant cases of plagiocephaly are usually associated with neck muscle imbalance: tightness and/or weakness of neck muscles on one side, resulting in the positional favoring. We have seen one newborn case where one eye was closed/ shut due to the extreme head deformation. In this case, the newborn was able to open his eye after 2 weeks of initiating physical therapy. In other severe cases, we have seen TMJ asymmetries where one side of the jaw didn’t open as wide as the other, affecting ability to latch on when feeding. The most common health limitations seen in toddlers and young children with persistent neck muscle imbalances & misshapen heads are gross motor developmental delays: delayed acceptance of tummy time, delayed rolling, crawling, asymmetrical crawling, delayed walking, asymmetrical walking and premature favoring of limbs on one side of the body. 13. Can early prevention and physical therapy prevent gross motor delays? Absolutely. Physical Therapy head & neck specialists can improve neck and body muscle imbalance before the child starts to develop asymmetrical gross motor movements and preferences. Your physical therapist should design a comprehensive program of improving head shape, correcting the underlying cause and preventing gross motor asymmetries and delays, to be completed within 3 to 5 months with the end result being: normalized head shape, facial symmetry, body symmetry, full neck muscle balance and age-appropriate gross motor function. April 16, 2013. Early Head Start, FYI's for New Parents. Leave a comment. Parent Testimonial of the Day! March 22, 2013. Tags: Spanish, testimonial. Testimonials. Leave a comment. It is rewarding helping Mom’s and their babies with PT! “The highly noted Dr Graham (out of Cedar Sinai) recommended PTSolutions when he examined my son at 2 months and found a moderate-severe Torticollis. I called PTSolutions that very day and they got me in immediately. Dr. Flores recommended a twice weekly program plus exercises at home. She worked with my son regularly over the next several months and his Torticollis went away. He still had to wear the helmut but when I went back to Dr. Graham he was exceptionally impressed with the work Dr. Flores had accomplished and that the Torticollis was gone! My son LOVES Dr. Flores. He was always happy to be at PTS and always comfortable with the very helpful staff! BTW – I liked how much Dr. Flores was invested in helping my son that I asked her to look at me and my neck/shoulder issues. She set up a program for me and has dramatically helped me improve my strength and ability to lift my son. A miracle after all the other failed physically therapy places I’d been. We strive for moments like this, impacting the lives of families on a daily basis. What a joy! December 5, 2012. Tags: Dr John Graham Jr, Dr. Yvette Flores, flat head syndrome, helmet therapy, plagiocephaly, PT Solutions, tight neck, Torticollis, wry neck. Testimonials. Leave a comment.